‘Where are you, my beloved land?’ asks Georg Philipp Schmidt von Lübeck in ‘Des Fremdlings Abendlied’. Set by Schubert (as ‘Der Wanderer’) in October 1816, this poem evokes the ongoing search for a sense of home within German Romantic poetry and the Lieder it inspired. Such thoughts dominated the songs of the nineteenth century, but they also stretch well into the twentieth century, including Ernst Krenek’s 1929 song cycle, Reisebuch aus den österreichischen Alpen. The year before Krenek completed his inventive work, the musical world had marked the hundredth anniversary of the death of Schubert. The Austrian National Bank issued a commemorative coin, a competition was held challenging composers to complete the ‘Unfinished’ Symphony, and performances of Schubert’s music took place around the world. Krenek, a somewhat plural figure within musical modernism, flirting with post-Romanticism, serialism and Zeitoper, with its jazzy tropes and lust for Americana, found surprising inspiration in Schubert’s work. ‘From him’, Krenek wrote, ‘we can best learn that highest vitality, which is constant variability and subtlest delicacy of expression [achieved by] the greatest economy of means. A change to the minor, for example, is in Schubert an unusual musical experience.’ Taking his lead from his predecessor’s vast output of song, Krenek decided to offer his own ‘unusual musical experience’ in the Reisebuch, celebrating the landscape and poetry of Schubert’s world, while commenting on his own. As well as evoking his recent trip, with an often journal-like frankness, Krenek alludes to his childhood, when he and his family would spend their summers in the Alps. But in looking back, the composer also shows that the idyll is not quite as it once appeared, with motor cars, trains, buses and hordes of tourists now crowding the view. Collectively, these songs mark the passage of time between the ‘Liederland’ of Schubert’s poetic contemporaries and that of 1920s Neue Sachlichkeit (‘New objectivity’). But despite the prevailing detachment of the interwar years, more subjective ideas of homelessness, nostalgia and lost innocence continue to emerge on Krenek’s revisionist journey, whose principal theme remains the search for Heimat, that nigh-untranslatable German word for home, in the personal, communal and philosophical sense. These songs are the clearest and most convincing proof I can possibly provide to bolster a theory that I advanced, at that time, against the atonalists, who explained that atonality is necessary because the old vocabulary was depleted. My theory claimed that it was possible to rejuvenate an earlier vocabulary and to restore its former vitality and freshness through a new and original experience. This theory is probably wrong, although it cannot simply be refuted by an opposing theory, so long as a single work based on the theory remains valid and alive, and today it would seem that my Reisebuch still possesses considerable vitality. Thematically and musically, these musical postcards are therefore as much a reinvestigation as they are a celebration. The cycle opens with Motiv. Its thrumming accompaniment and yearning melody show clear affinities with Schubertian models, just as the references to journeys, the open air and the promise of self-discovery invoke other key Lieder tropes. But while these might also portend a succession of backward glances, the twentieth century soon snaps into view in Verkehr, with its modern vehicles provoking a more acerbic tone. The monks in Kloster in den Alpen have a balanced view of life. Granted certain mod cons, they are unaffected by the weather that dogs the travellers of the Romantic past or those journeying along the traffic-clogged roads of Krenek’s era. Wetter is characterized by both meteorological imagery and human emotions, though the song’s rather barbed language underlines the fallaciousness of any metaphorical equivalence. At the beginning of Traurige Stunde, Krenek writes that ‘Not every day of travel is good and festive’, and so, while the accompaniment starts diatonically, it becomes increasingly chromatic, occasionally teetering on the atonal, with the traveller’s sense of belonging seeming ever more distant. Such transient thoughts dominate Friedhof im Gebirgsdorf, which closes the first volume of the Reisebuch on a mortal note. The second part of the cycle opens with Regentag, in which the weather, a major enemy to bygone wanderers, is now just a slight hindrance, as described by the gentle but insistent chromatic trickle in the piano. Unser Wein (headed ‘Dem Andenken Franz Schuberts’) is a tipsy drinking song, in which Krenek celebrates Austria’s viticultural fecundity. As more wine is imbibed, the song departs from the diatonic parameters of the introduction, though the final image of a vineyard, perched high in the hills, prompts music of disarming delicacy. Rückblick is more disconcerting, pitting angular lines against shimmering gestures. ‘What have I gained so far from all this?’, Krenek asks. The response is not entirely clear and when it comes to the existential question of where we ultimately belong, the city-born Krenek is unsure (as the ongoing musical conflict shows). Having mocked his fellow travellers in Auf und ab, as they compete for parking spaces and free tables at the tavern, Krenek offers the caustic, folkloristic potpourri Alpenbewohner. Politik opens the third volume with a manifesto—not without irony—in which Krenek tells his fellow Austrians to live for the sake of living and find motivation in the freer life of the mountains. Gewitter, on the other hand, provides a leveller, as the rain, described in a furious piano part, lashes everyone. Little wonder Krenek hankers for the darker magic of Vienna in Heimweh, the glories of the mountains notwithstanding (portrayed in the lilting Heißer Tag am See). Finding himself in a Kleine Stadt in den südlichen Alpen at the beginning of the final part of the Reisebuch, Krenek is afforded a spectacular view, which he evokes in Ausblick nach Süden. The composer had clearly thought that he had found paradise in Austria, but wonders whether heaven actually lurks beyond the Alps, ‘wo die Zitronen blühn’, as Goethe famously suggested. Making a decision to ‘Love the world as it is!’ in Entscheidung, Krenek boards the train to Vienna, with a wry echo of the finale to his 1927 hit opera, Jonny spielt auf, when the eponymous fiddler leaves for the New World. In Epilog, Krenek leaves unanswered the question about where home can be found: ‘I do not wonder that I am, despite everything, happy!’ Such resilience was to stand him in good stead. Not long after the publication of the Reisebuch, Hitler rose to power in Germany and Krenek and Schubert’s homeland was soon under threat from the same forces. The Anschluss was finalized in early 1938, forcing Krenek to recognize that his Heimatland would never be the same. Like his operatic hero, Jonny, he left for the USA, where he died in 1991. „Wo bist du, mein geliebtes Land?“ fragt Georg Philipp Schmidt von Lübeck in „Des Fremdlings Abendlied“. Dieses von Schubert im Oktober 1816 vertonte Gedicht („Der Wanderer“) beschwört den in der romantischen Lyrik vorherrschenden Topos des fortwährenden Suchens nach einer Heimat; ein Topos, welcher ein beträchtliches Korpus an Liedern inspirierte. Derartige Gedanken dominieren die Lieder des 19. Jahrhunderts, ziehen sich jedoch auch noch ein ganzes Stück ins 20. Jahrhundert hinein, so etwa in den Liederzyklus von Ernst Krenek aus dem Jahr 1929: Reisebuch aus den österreichischen Alpen. Ein Jahr bevor Krenek sein originelles Werk vollendete, hatte die Musikwelt den hundertsten Todestag von Franz Schubert begangen. Die Österreichische Nationalbank hatte eine Gedenkmünze herausgegeben, ein Wettbewerb mit dem Ziel, die „Unvollendete“ fertigzustellen, war veranstaltet worden, und schließlich wurden in der ganzen Welt Aufführungen der Werke Schuberts gegeben. 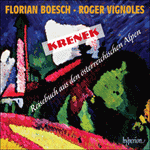 Krenek war eine vielseitige Figur innerhalb der musikalischen Moderne—er spielte sowohl mit der Postromantik, der seriellen Musik und der Zeitoper mit ihren jazzartigen Tropen und Lust nach Americana—und fand überraschende Inspiration in den Werken Schuberts. Krenek schrieb: „Höchste Lebendigkeit, d.i. stete Variabilität und subtilste Feinheit im Ausdruck bei größter Ökonomie der Mittel, können wir von ihm am besten lernen. Eine Wendung nach Moll z.B. ist bei Schubert noch ein entscheidendes musikalisches Ereignis.“ Als Reaktion auf das riesige Liederoeuvre seines Vorgängers verzeichnete Krenek seine eigenen „ungewöhnlichen musikalischen Erlebnisse“ in dem Reisebuch, mit dem er die Klanglandschaft und Lyrik der Schubert’schen Welt zelebrierte und die eigene kommentierte. Krenek zeichnete dabei nicht nur mit oft journalistischer Offenheit seine gerade beendete Reise nach, sondern spielte auch auf seine Kindheit an, als er mit seiner Familie die Sommermonate in den Alpen verbracht hatte. Indem er jedoch zurückschaut, zeigt der Komponist ebenfalls, dass das Idyll nicht mehr das ist, was es einst zu sein schien—inzwischen waren Automobile, Eisenbahnen und Autobusse dazugekommen und ganze Horden von Touristen tummelten sich an den Aussichtsplätzen. Insgesamt gesehen kennzeichnen diese Lieder den Verlauf der Zeit vom „Liederland“ der poetischen Zeitgenossen Schuberts bis hin zu der Neuen Sachlichkeit der 1920er Jahre. Der vorherrschenden Distanziertheit der Zwischenkriegsjahre zum Trotz bilden sich in Kreneks revisionistischer Reise subjektivere Themen wie etwa Heimatlosigkeit, Nostalgie und verlorene Unschuld heraus: der Haupttopos ist nach wie vor die Suche nach einer Heimat, sowohl im persönlichen, gemeinschaftlichen als auch philosophischen Sinne. Diese Lieder sind der deutlichste und überzeugendste Beweis, den ich zugunsten einer These anbringen kann, die ich zu jener Zeit gegen die Atonalisten formulierte, welche die Atonalität als notwendig erklärten, da das alte Vokabular ausgeschöpft sei. In meiner These argumentierte ich, dass es möglich sei, ein älteres Vokabular zu verjüngen und es durch ein neues, originelles Erlebnis in den Zustand seiner früheren Vitalität und Frische zurückzuversetzen. Diese These ist wahrscheinlich falsch, obwohl sie nicht einfach durch eine Gegenthese widerlegt werden kann, sofern ein einziges Werk, dem die These zugrunde liegt, gültig und lebendig ist; und heute hat es den Anschein, als besitze mein Reisebuch eben jene beachtliche Vitalität. Sowohl in thematischer als auch musikalischer Hinsicht stellen diese musikalischen Postkarten also einerseits eine Neuerkundung und andererseits ein Zelebrieren dar. Der Zyklus beginnt mit Motiv. Die klimpernde Begleitung und die sehnsuchtsvolle Melodie zeigen deutliche Parallelen zu Schubert auf, ebenso wie die Verweise auf das Reisen, die Natur und die Zusicherung der Selbstentdeckung weitere charakteristische Tropen des Liederrepertoires aufrufen. Doch während diese auch auf eine Reihe von rückwärts gerichteten Blicken deuten könnten, taucht das 20. Jahrhundert schon bald am Horizont auf: Verkehr löst mit seinen modernen Fahrzeugen einen eher bitteren Tonfall aus. Die Mönche im Kloster in den Alpen haben eine ausgewogene Lebenseinstellung. Sie sind mit modernem Komfort ausgerüstet—das Wetter, das die Reisenden der romantischen Vergangenheit plagte, und der Verkehr auf den Straßen der Zeit Kreneks zieht sie nicht in Mitleidenschaft. Wetter zeichnet sich sowohl durch eine meteorologische Symbolik als auch menschliche Emotionen aus, obwohl die recht spitze Sprache des Liedes die Falschheit jeglicher metaphorischer Gleichwertigkeit unterstreicht. Zu Beginn der Traurigen Stunde schreibt Krenek: „Nicht jeder Reisetag ist schön und festlich“. Dementsprechend beginnt die Begleitung diatonisch, gestaltet sich dann zunehmend chromatisch, bisweilen fast ans Atonale angrenzend, während das Zugehörigkeitsgefühl des Reisenden sich immer mehr verflüchtigt. Derartige Gedanken der Vergänglichkeit herrschen im Friedhof im Gebirgsdorf vor, mit dem der erste Teil des Reisebuchs endet. Der zweite Teil des Zyklus beginnt mit Regentag, wo das Wetter—in der Vergangenheit ein ernstzunehmender Feind der Wanderer—nur noch ein kleines Hindernis darstellt, welches sich in dem leichten, jedoch beharrlichen, chromatischen Tröpfeln des Klaviers äußert. Unser Wein trägt den Untertitel „Dem Andenken Schuberts“ und ist ein angeheitertes Trinklied, mit dem Krenek die fruchtbare Weinkultur Österreichs zelebriert. Je mehr Wein konsumiert wird, desto weiter entfernt sich das Lied von den diatonischen Parametern der Einleitung, obwohl des letzte Bild, ein hoch in den Hügeln gelegener Weinberg, eine Musik von entwaffnender Zartfühligkeit mit sich bringt. Rückblick hingegen zeichnet eher befremdliche, fast aggressive eckige Linien nach, die gegen schillernde Gesten gesetzt sind. „Was hab’ ich bis jetzt nun gefunden?“, fragt Krenek. Die Antwort darauf, ebenso wie auf die existenzielle Frage, wo wir letztlich hingehören, ist nicht klar—auch der fortwährende musikalische Konflikt verdeutlicht dies. Nachdem er in Auf und ab die Touristen verhöhnt hat, die sich um Parkplätze und Gasthaustische rangeln, wartet Krenek mit dem bissigen „Folkloristischen Potpourri“ Alpenbewohner auf. Der dritte Teil beginnt mit Politik, ein Manifest, welches nicht einer gewissen Ironie entbehrt, in dem Krenek seine österreichischen Landleute dazu aufruft, um des Lebens willen zu leben und sich an dem freieren Leben in den Bergen zu orientieren. Das Gewitter hingegen wirkt egalisierend, wenn der Regen, der in der zornigen Klavierstimme dargestellt wird, alle gleichermaßen trifft. Darauf ist es kaum überraschend, wenn Krenek sich in Heimweh nach dem dunklen Zauber Wiens sehnt, trotz aller Pracht der Berge, die in dem wiegenden Lied Heißer Tag am See nachgezeichnet wird. Zu Beginn des Schlussteils verweilt Krenek in einer Kleinen Stadt in den südlichen Alpen, wo er ein herrliches Panorama genießt, das er im Ausblick nach Süden beschreibt. Der Komponist war offensichtlich der Überzeugung gewesen, in Österreich das Paradies gefunden zu haben, fragt sich allerdings nun, ob sich jenseits der Alpen, „wo die Zitronen blühn“, der Himmel befindet. In der Entscheidung geht es darum, die Welt so zu lieben, wie sie ist. Darauf tritt Krenek die Heimkehr an und fährt mit dem Zug zurück nach Wien, wobei ironisch auf das Finale seiner äußerst erfolgreichen Oper Jonny spielt auf von 1927 verwiesen wird, in dem sich der gleichnamige Fiedler in die Neue Welt aufmacht. Im Epilog lässt Krenek die Frage nach der Heimat unbeantwortet: „doch mich wundert’s trotzdem nicht, dass ich trotzdem fröhlich bin!“. Eine derartige Widerstandskraft sollte ihm gut zustatten kommen. Nicht lang nach der Veröffentlichung des Reisebuchs kam Hitler an die Macht und nach dem „Anschluss“ zu Beginn des Jahres 1938 musste Krenek einsehen, dass sein Heimatland nie mehr so sein würde wie zuvor. Ebenso wie sein Opernheld Jonny reiste auch er in die USA, wo er 1991 starb. I set out to discover my homeland. whether home for us means where we were born. except the country we belong to. through the forest, over the multi-coloured spring meadows. and not put there by man. the pace is so leisurely and you can feel the landscape you pass through. But you only really meet people when travelling by bus. alleviating the excruciating crush with a pleasantry. the bus often skids quite alarmingly. But all will be fine, all will be fine, just be patient! And we’ll all reach our destination and smile cheerfully. when the road is rough and dangerous? Only Mister Average is acclaimed. possessing a talent for overcoming poverty and their own indifference. immovable and undisturbed by the flux of time. they are not slaves to technology as we are. what they deem fit for them to see. hangs over the great building, remains unrevealed. on what a pointless life you lead. neither cosy nor compliant to a traveller’s wishes. because it lacks the ever-shining sun. and the silent rain falls drop by drop. unfounded restlessness, and my heart grows heavy. merely to see how things are there? What do you bring us? What do you want here? loom higher and higher, loom and suffocate me. Another link severed from the narrow chain! The early morning light banishes the ghosts. to new adventures, and the gloom is forgotten! since the meagre level ground must serve the living. and as hard and laborious as their bitter life. children’s clothes hang drying on the crosses. when a new corpse is flung into the pit. jumbled piles of bones beneath. and so it is that even the dead earn a living. and the giant gravestones, these eternal mountains, collapse? that even the living are not very happy here. There are rainy days that are very beautiful. the sun appears, shining through damp veils. and the clouds descend in ever increasing gloom. and you know that it will rain all day. and today will be a day of rest. a peasant woman with an umbrella. you savour it at leisure, simply to pass the time. And idleness that only here you can relish! From the south and from the east our wine lays siege to our Alps. only by those who know how to seek it out. little green men climb up, leaning on their grey sticks. No 09: Rückblick Was hab’ ich bis jetzt nun gefunden? What have I gained so far from all this? Inner peace has not yet come to me. Things are not easy for us in these days of conflict. evidence in every house of better times when we were still close to nature. Have these ties really been severed for us once and for all? Must we then accept the disintegration of life’s worth, the coarsening of human kind? Who can tell us where we belong? Where? as if someone behind them were firing blank cartridges. and seeing nothing, because they must write postcards. beautiful views, hotel rooms and all the rest of it. is carried out with apathy. when the rabble step on their toes. each summer and winter the patient trains spew out their hordes. Grasshopper-like they cover the countryside. as though they wished to wake the mountain kobold. who speak so oddly, though it is meant to be German. reckless, ghastly, herd-like, with black travelling trunks. (with eighteen holes), they would fit in charmingly with the whole. join together in a desperate sing-song. which booms with the barbarians’ bawling. The end of the world must be like that! must politics dominate everything, everything in this country? Are we paying for our sins with incurable madness? Have you quite forgotten to live for the sake of life? of the east and south who were united with us. not passed the test, being badly prepared by bad teachers. The punishment was terrible. Or have you forgotten? Remember the times, brothers, when thousands of us fell daily, victims of evil! misery, cold, darkness were for years the only companions and rulers of our lives. if they didn’t choose to hang themselves in a noose of threadbare rope. that we must now tear each other limb from limb? Have you lost all pleasure in life? Can no day exist without bitterness? shut down the macabre circus—enough is enough! Or things will get even worse, and we shall perish. and learn from them, even though it is late, for soon it will be too late! Brothers, listen, the time has come! the like of which has never been heard in these Alps! Brothers! The time has come! clouds, yellow and dangerous, close in from every quarter. The heavens send down torrents, the thunder rolls roaring from summit to summit. and thinks with justification that nature is not for him. Come, O storm, and cleanse us from stupidity, wickedness, creeping nastiness! Clear our heads once more, so that the mind’s rainbow might shine forth! black destruction hangs over us! and the highest peaks tower up like ghosts. and the sun fills the valley with boundless radiance. I feel homesick for my city. All is simple and honest, vast and violent in these Alps too. There, however, all is still wreathed in secrecy, the spell of dark, tangled, splendid history. of times long gone are reflected in small and obscure things. and not the latest fad. through the green gate I see in the old courtyard the lime tree. which, filling confined spaces, then encompasses all. Were its entire expanse to appear shattered, the spirit would remain intact! Though some people deny this spirit, I shall remain faithful. It will surely be respected once more, when the madness of these times is over. and the sun shines with unfamiliar heat. making the mountains distant and pellucid. and man’s lot is not merely to fight. Only a little fish leaps occasionally with a gentle sound over the water. Is this perhaps the Promised Land? Is this perhaps the homeland I seek? bizarrely hollowed out by mankind. Life teems among them, and one senses a different race. borne here once on a good wind. a little village is perched, standing bright against the blue sky. for we are, after all, in the south, and life becomes worth living again! Be praised, you merry town! while clouds still lour here. And yet it sometimes seems to me as if I might be happier there. and so we envy everyone who is different from us. and only when we are quietly content with little, will that happiness perhaps be ours. No 18: Entscheidung Die Sehnsucht wird immer weiter bohren, denn wir lieben das! Longing will never cease to gnaw, because we like that! When nature and man are one and everything happens in harmony! But I shall always desire it, though it be impossible! and always long for the new, for as long as my little light glows! And so the fast train carries me home again, the journey is ended. and I experience anew the pain of transience. and so I shall set out again and do so with pleasure. Yet may it be granted me to find a homeland on my return. Would you care, you, our beautiful country, to be my homeland! On the day after my return I walk through the wine village on the eastside of town. The road is strange that takes you there. low-set, sombre, with narrow doors, like the graves of oriental kings. A king does indeed sleep there, silently behind thick green shutters: the wine! I live, and do not know how long. I die, and do not know when. I wonder that I am still so happy. Alarmed, I stop. Is this the final wisdom of every journey, indeed of all life? Here, so near at hand? Eternal conflict of all creatures! but despite that, I do not wonder that I am, despite everything, happy!